Russia Foreign Minister Sergei Lavrov said Wednesday that the US can rarely separate terrorists and opposition in Syria's southern de-escalation zone. "We have also pointed out the need for the implementation of agreements on the southern de-escalation zone, deals which were reached by the United States, Russia and Jordan on all aspects, including the continuation of the uncompromising struggle against terrorists from Islamic State and JabhatFatah al-Sham, which control about 40 percent of the southern de-escalation zone," Lavrov said after the talks. The allegations made by Western media outlets and politicians about ethnic cleansing during anti-terrorist campaigns in Syria's Eastern Ghouta and eastern Aleppo were false, Lavrov said. "As for eastern Aleppo and Eastern Ghouta, we recall outcry in Western media outlets and Western political circles regarding violations of international law, and even ethnic cleansing campaigns during the offensives to liberate these areas from terrorists. All this turned out to be lies," Lavrov said after a meeting with his Jordanian counterpart Ayman Safadi in Moscow. According to Lavrov, he raised the issue of lifting unilateral sanctions against Syria at talks with his Jordanian counterpart Ayman Safadi. "Russia has also repeatedly noted the need to remove all unilateral sanctions imposed by the Western countries against the Syrian Arab Republic, sanctions that prevent from ensuring normal economic, infrastructure conditions for return of refugees," Lavrov told a press conference after talks with Safadi. According to the Russian foreign minister, it was unrealistic to expect Iran to leave Syria and stop playing a role in the region, becoming self-isolated. "It is clear that this is absolutely unrealistic and that it will not be possible to solve regional problems without the participation of its key countries, including Iran, Saudi Arabia, Jordan, Egypt and many others," Lavrov stressed. 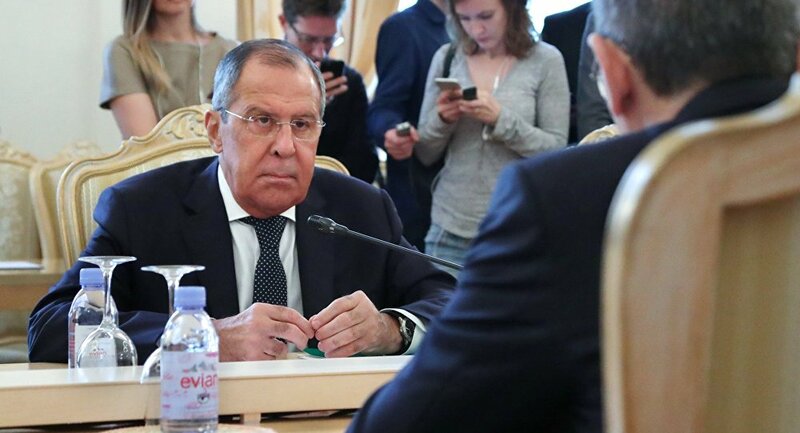 At a press conference after a meeting with his Jordanian counterpart Ayman Safadi in Moscow, Lavrov noted the issue of Iran's presence in Syria that was being widely discussed in Western media. According to multiple media outlets, the situation in Syria will normalize as soon as Iran leaves the country and abandon its regional ambitions, opting for self-isolation instead. Earlier in the day, Lavrov held negotiations with his Jordanian counterpart Ayman Safadi, who arrived in Moscow on a working visit. In May, local media reported that Syrian government forces have been redeploying Syrian army units from Damascus and other parts of Syria to the southern front. US State Department made a statement later that it would give a decisive response to a possible Syrian army's offensive in southwestern de-escalation zone.